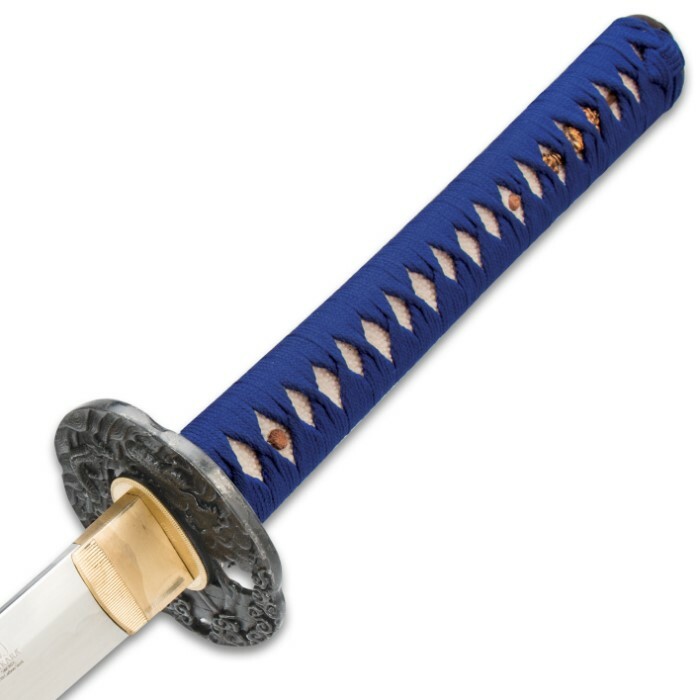 Sokojikara Turbulent Blue Handmade Katana / Samurai Sword - Hand Forged, Clay Tempered T10 High Carbon Steel - Genuine Ray Skin; Iron Tsuba - Functional, Full Tang, Battle Ready | BUDK.com - Knives & Swords At The Lowest Prices! Savage yet beautiful, tough yet graceful, Sokojikara's “Turbulent Blue" Katana is a wild animal in the refined trappings of a nobleman. 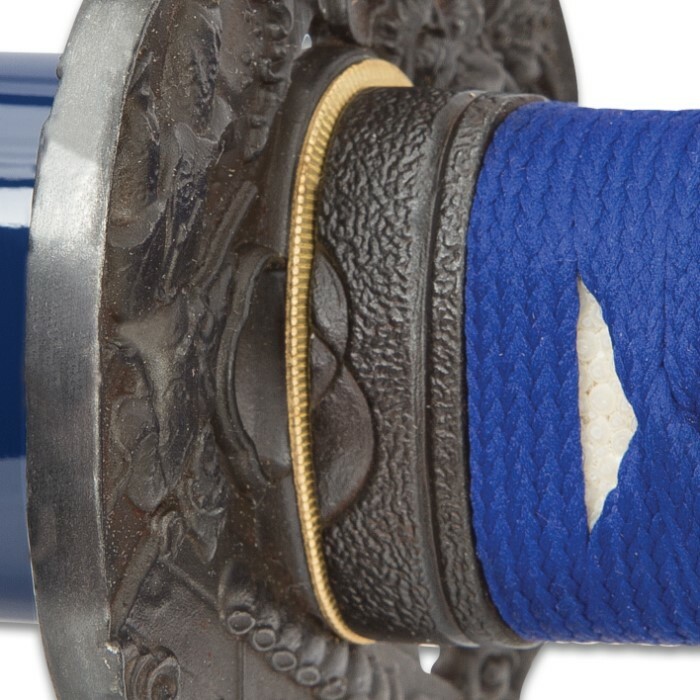 This traditional Japanese samurai sword is beautiful, eye-catching and no doubt impressive from the very first glance. But many of the Turbulent Blue’s greatest treasures lie beneath its striking visual facade, and some - like clay tempering - are even altogether intangible. 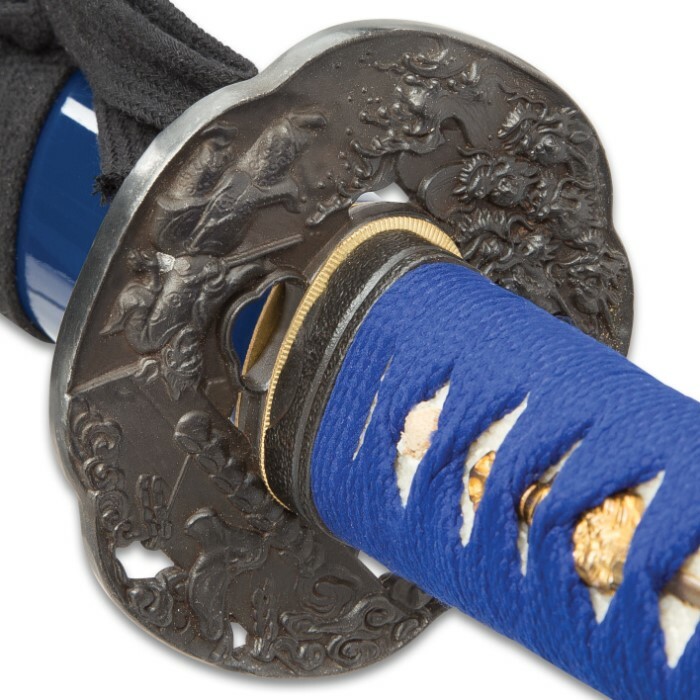 The Turbulent Blue is a veritable swordcraft goldmine, never ceasing to yield rich sword-wielding experiences from the moment you first grasp the tsuka to your inaugural cut and every time you brandish it beyond. Clay tempering imparts edge retention that's simply without equal. Like a koi gliding through a still pond, the Turbulent Blue's blade slices through rolled bamboo tatami mats and even cinder blocks cleanly and effortlessly, suffering neither crack nor fissure and all-the-while retaining its razor sharp edge. The Turbulent Blue can withstand such punishing cutting trials thanks, largely, to clay tempering. Prior to the intense heat of the hardening phase, Sokojikara's seasoned swordsmiths coat the newly formed, unrefined blade with clay - a thin layer along the edge, a thicker layer on the body and spine. When the blade emerges from the hardening forge, the clay layers' contrasting thicknesses cause the steel to cool at slightly different rates, yielding two distinct hardness regions. The less-insulated edge cools faster, making it harder for superior edge retention and shear strength. The thicker, more insulating coat of clay causes the body/spine to cool more slowly, rendering it "tougher"- less brittle, more flexible and better equipped to absorb impact energy. Though conceptually simple, clay tempering requires skilled hands and years of experience. It’s a slow, labor-intensive process that has changed little since its 15th century origins. But when you see the Turbulent Blue in action, you’ll undoubtedly agree it’s well worth the time and effort. The Turbulent Blue's weight is shrewdly distributed to maximize swinging momentum and power, blow after devastating blow. This impeccable balance also improves control and responsiveness, allowing for greater agility and flexibility in combat. 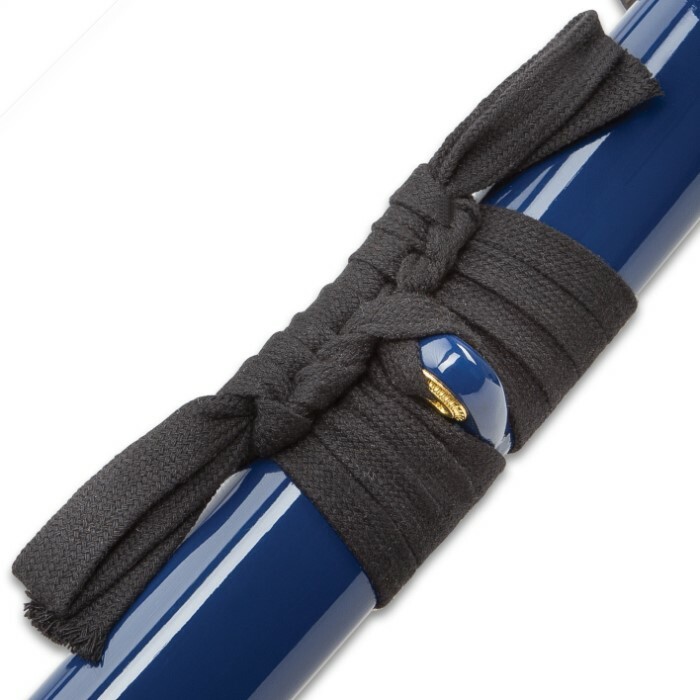 The delicately textured genuine ray skin same and soft braided ito that cloak the tsuka afford a comfortable, no-slip grip, further enhancing the Turbulent Blue’s superb feel. 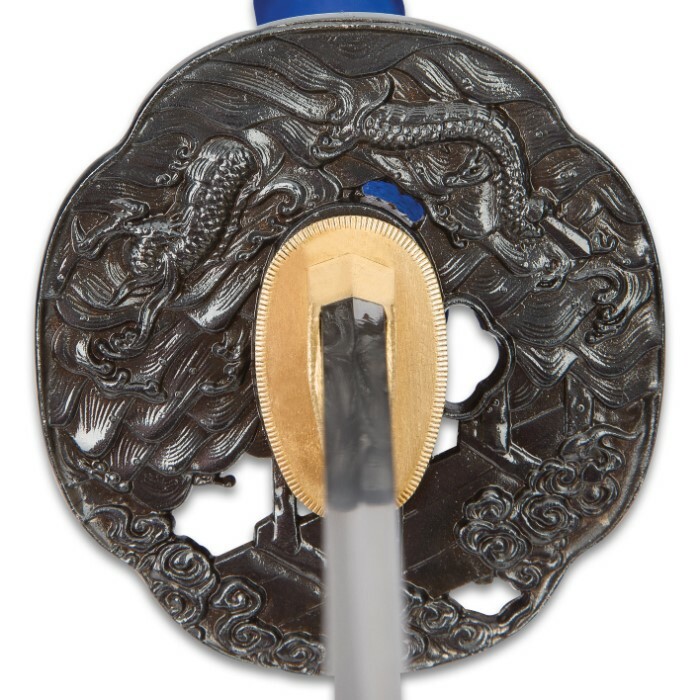 Flawlessly cast from iron like katana of ages past, the tsuba is embellished with fine reliefs depicting a menacing dragon-like sea monster swimming in a tempestuous ocean marked by roiling waves. A classic brass menuki is nestled between ito and ray skin same, offset by traditional bamboo mekugi. 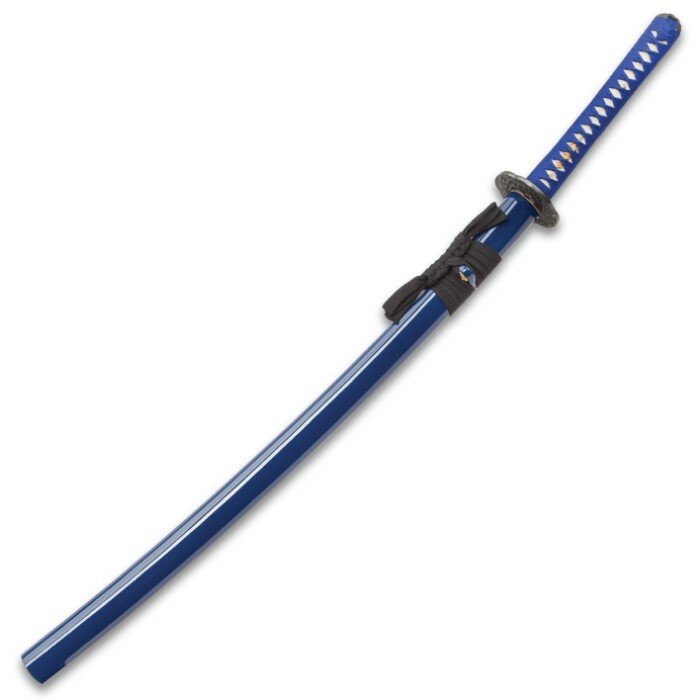 The Turbulent Blue has proven itself time and again, and it holds its own against any of today's most expensive katana, outperforming many. 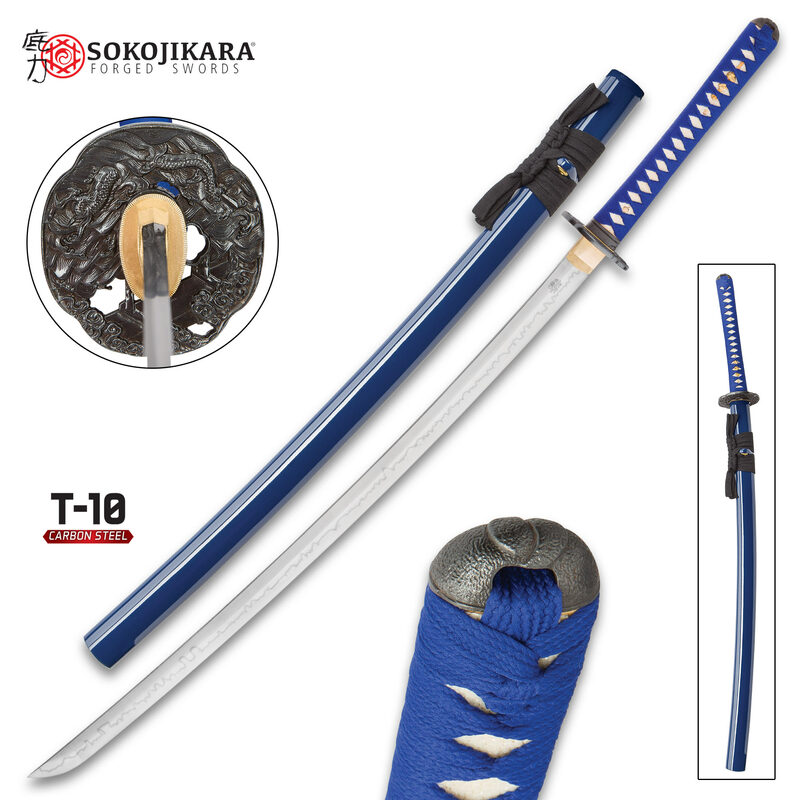 But the old cliché is true - "action" does indeed "speak louder than words," and at this unbeatable, downright unheard of price, why deny yourself the opportunity to experience Sokojikara's Turbulent Blue Katana for yourself? No matter how you use it, with proper care you can enjoy it for a lifetime, then pass it down to your children, grandchildren or great-grandchildren! The Turbulent Blue is heirloom-quality and built to be treasured by generations of your descendants - your legacy preserved in hand forged steel. Nice aesthetics for a good price, sharp and functional. I like this sword but have purchased cheaper swords that was way sharper than this one. This sword has grown on me. The blade is really good. It is very solid, well balanced, and strong. It is an excellent cutter. The wrapping and all of the furnishings remain tight after several weeks of moderate use. I was a little hard on this sword on my first review. I like this sword. It has an excellent blade and cuts well. Good balance, weight and fit. The handle cord wrapping was good, the Menuki looked a little cheap and the bamboo pins were not finished or sanded down in anyway and look sloppy detracting from what should be a nice Show piece. There are other swords in this price range that are better and there are swords for less that are better. The ray skin is also sloppy looking. The blade is what makes this sword attractive to me. I compare this to the CAS Hanwei Practical XL Lite Katana. Comparable workmanship, better components, better blade. 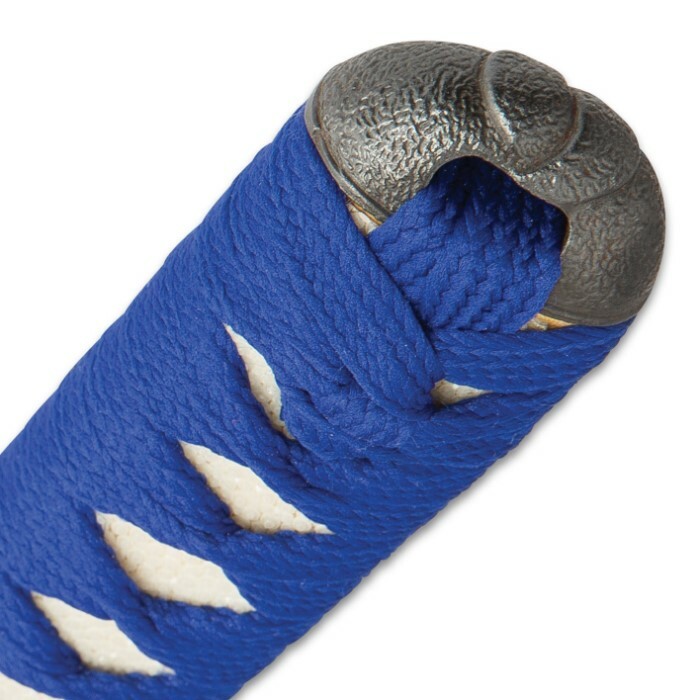 The Sokojikara gets hurt mostly for the sloppy workmanship on the handle. I buy a lot of swords and will get the bamboo one too. I am very happy with BudK overall. Just one question, if I actually order the stuff in my cart, can I get a date with that cute blonde on the Pop up?